Wouldn’t the world be an ideal place if all you, as a physician, had to do was take care of patients? Instead of having the hassle of paperwork, claims, prescription drug headaches, and laws to abide by that govern your practice, you spent your entire day attending to the needs of others? Isn’t that the whole reason you went to medical school in the first place? Alas, we don’t live in an idyllic world; hence, we must return to reality and the reality that is the modern healthcare system: endless documenting patient services and submitting claims, waiting for reimbursements, and dealing with denials and resubmissions. Comprehensive Healthcare Revenue Management (CHRM) specializes in medical coding and billing. We help doctors and physicians simplify their lives. Outsource medical billing. One way medical practitioners can focus more on patient care is to outsource medical billing. When you outsource medical billing, you are hiring experts who spend their entire day submitting and processing claims, dealing with insurance companies and denials, and working to maximize your revenue cycle. An outsourced medical biller is more likely to maintain compliance and stay up-to-date on changes in the medical industry. Furthermore, by removing medical billing services off the shoulders of your staff, you are allowing them to better serve patients as well as take the stress off your plate of your staff dealing with medical billing, which does affect the entire team. Automate tasks. Repetitive tasks that you do day-in and day-out can be automated if at all possible. You can automate reminder calls and/or confirmation calls for appointments. Prescription refill verifications for those who get the same prescription every month can be automated. Systemize processes. If you do the same thing with every patient, the process will become faster with less errors made if you systemize it. For example, when a patient checks in, ask them the same questions in the same order, take their payment and insurance information if applicable, and hand them any appropriate paperwork to fill out. Have all your front office staff do the same thing every time. Not only will this almost virtually eliminate missing information needed for insurance processing, but it will also help your staff remember to collect payments and signatures. You can also have your nurses or physician assistants intake patients in the same way every time — down to the order they measure height, weigh the patient, and take vital signs. This is another great way to decrease stress (which occurs when a nurse realizes he or she forgot something) and collect all the information you need for diagnoses and overall outstanding patient care. Standardize offices. Another great way to simplify your office and to eliminate stress (since losing items and searching for them is one of the most common stresses in our lives) is to set up your patient exam rooms all the same. Have the same items in the same drawers, the trash cans in the same place, and the hazard waste disposal in the same place. If you have multiple physicians in your medical practice, you can streamline their initial evaluation techniques as well, especially if you have newer practitioners. Doing things the same way eliminates stress and anxiety for patients who know what to expect and prevents the physician from forgetting to collect important pieces of information. Team build. Having your staff on the same page is imperative for a smooth, efficient, and peaceful running medical practice. Holding team-building functions that are fun can go a long way in fostering a collaborative work environment. Feeding your staff lunch once a month can show your appreciation for all their hard work. Reward employees for going above and beyond. Notice employees. Throw a Christmas party. Give a birthday gift. Taking care of patients is hard work. Let your team know you appreciate them in small ways that can add huge dividends in the long run. Go paperless. With modern technology, there is really no need to be drowning in paperwork stacked on desks. Most forms can be electronically signed and stored. Prescriptions can be submitted electronically. New patient forms can be filled out online before the office visit, and any forms the patient brings in can be scanned and stored in their file, and the paper copy returned to the patient. Offer online patient scheduling. Your front office staff probably spends a good deal of their day on the phone with patients. By offering online patient scheduling, both the patients and the staff benefit. Patients can see what appointments a provider has available and can quickly schedule an appointment that meet their schedules — at anytime and anywhere, which is useful for new moms who hardly have a second to themselves. Staff can spend less time answering the phones and more time serving patients in the office with online scheduling. According to an Advisory Board report, doctors only spend 27 percent of their time with patients. 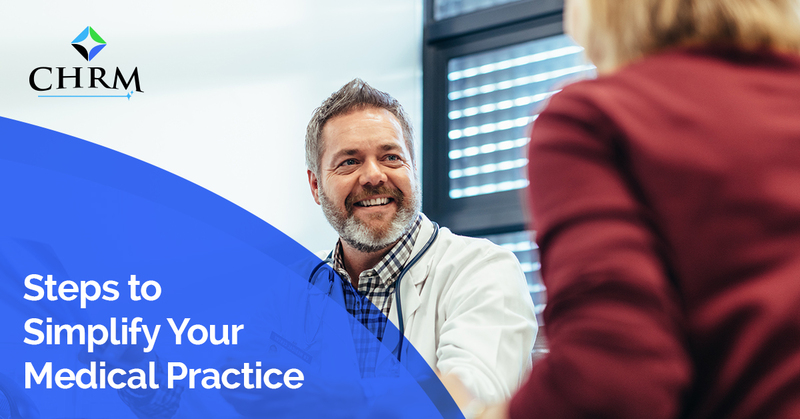 By simplifying your medical practice, you can somewhat return to your idyllic picture of spending most of your time with patients. Our mission is to see you fulfill your idyllic dreams as close as you can. Contact CHRM for all of your medical billing needs today!